ffmyheels: fun in the sun. 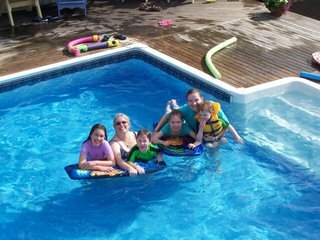 Here's the whole gang at Ruthanne's pool. Aunt Pat also treated us to Chinese food for supper. She ordered it and picked it up in New Minas & we ate with Ruthanne by the pool. Ruthanne got out the wine for us. Such a cool, relaxing day. Thank you Daddy for sending us home to Nova Scotia!!!!!!!!! !